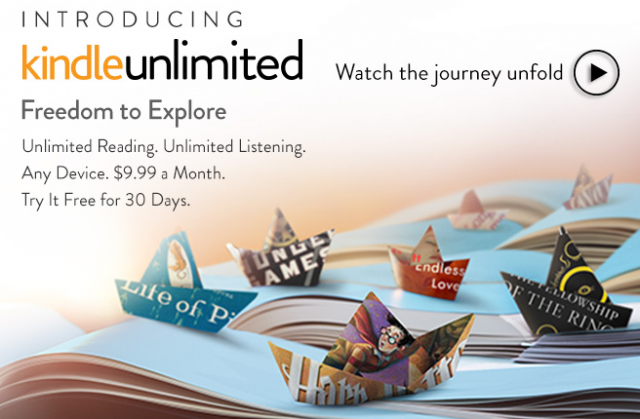 As a library lover, I have to wonder what the future holds in the wake of Amazon’s Kindle Unlimited announcement. $9.99 a month now buys access to over 600K titles. Of course, there are many more millions of books in the world, but what are the majority of people reading? My guess is that most people read mainstream fiction and nonfiction that will soon be available (once more publishers participate) to Kindle Unlimited subscribers, while researchers delve into the library stacks out of necessity. More affluent people may opt to pay their own way with Kindle or print books, while a large number of people will still need (or want) access to “free” library books. Quite possibly, Kindle Unlimited could be a new proxy for American class structure, sort of like Netflix streaming ($8.99/month) vs. Redbox ($1/movie). So, what is the future of public libraries if the majority of tax dollars are coming from people who can now afford to shift to Kindle Unlimited? Working with the assumption that people read either for entertainment or knowledge, my response is that libraries should borrow the “treasure hunt” concept from Costco. The large retailer is known for shuffling its floor layouts to have its customers “hunt” for staple products, while discovering a number of other products that can become impulse buys along the way. The formula works, as each trip to Costco yields an unexpected, and presumably satisfying, treasure hunt experience. Applying this concept to libraries, patrons could experience a similar rush for entertainment and knowledge. I can imagine a library so flexible that a young couple on a Sunday afternoon might say “let’s check out what the library has going on,” for entertainment rather than resorting to a tedious menu-scroll of on-demand movie listings. What if the library had a cooking station that tied in with cookbooks, a small greenhouse that supported the gardening section, a gallery for the art section, or a Hollywood-style “experience theater” that conveyed history as a tie-in to the year’s best-selling novel? What if a library’s offering changed as frequently as Costco’s inventory? Libraries certainly have special programming now, but they are not as dynamic as they will need to be in the future. Pressed for space, funds, and the public’s support, libraries will need to re-invent themselves now that Kindle Unlimited threatens their middle-class turf. As Costco proves everyday, there is still a huge demand for the thrill of discovery, and my hope is that libraries can pivot their operations to fulfill a similar need as related to entertainment and knowledge. Let’s just hope that the libraries of tomorrow won’t need forklifts.